* I guess the cynical way to read this press release is that Wizard Entertainment has finally fired enough people they can fit everyone that is left into their New York City sales office, but that would be mean. I think it's good for a magazine to be in New York City proper, and wish them luck. 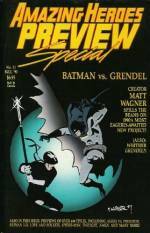 * the writer Douglas Wolk scans the shelves at the Hicksville lighthouse for books that were announced in an Amazing Heroes Preview Special but then never existed. For those of you too young to remember the Amazing Heroes Preview Special it was sort of like having the bulk of your comics Internet activity show up in print form at your comic shop a few times a year. * not comics: Dave Astor, who provided so much solid coverage of comics for years at Editor & Publisher will have his humor column appear under the Huffington Post umbrella, or whatever string of English words applies to that sort of relationship. * apparently Kurt Busiek sporting a Green Lantern ring scares very few people, while Warren Ellis with that same ring scares many people. It must be Friday. * finally, everyone interested in the ins and outs of the comics business should read this short interview with Fantagraphics' Eric Reynolds, where he expounds on some of the points concerning the Diamond minimums he originally made back in January when they were announced. It's true as Reynolds claims that most folks other than the big companies were moving away from the cheaper comics significantly affected by the new minimum order levels. I think it's good for people to realize that. My objections -- which aren't in opposition to anything Reynolds says, but maybe come from a different vantage point and thus sport a different emphasis -- are in the nature of the standard applied (the "fairness" of establishing levels as opposed to the "burden" of working supplier to supplier) and in the irrevocable nature of the move. While the trend has been a move away from alternative and independent comic books, I'm not convinced the market for comics has settled in a way that options should be eliminated. I'm totally confident Fantagraphics has a vision for its publishing future that may or may not include pamphlet-style comics. I get no sense of any picture of the future at all coming from Diamond.